Blizzard VP of Game Design Rob Pardo has confirmed hints from earlier this month that action-RPG Diablo III won't see a 2010 release - but that WoW: Cataclysm and StarCraft II aren't to blame. Earlier this month, we learned that the highly-anticipated slash-and-loot Diablo III wasn't in Blizzard's forecast for 2010 alongside World of Warcraft: Cataclysm and the first part of StarCraft II. Speaking with Techland, Blizzard's Rob Pardo confirmed that it was safe to say that D3 wouldn't be in our hands next year. "We always announce all of our games too early," admitted Pardo, and he has a point: Diablo III was announced July 2008, whereas StarCraft II was unveiled in May 2007 and still isn't out. "We realize that and go, 'You know what? Next time we're not going to do that.' And then we always fail at that. But I'd rather fail at that than fail at making the game great." 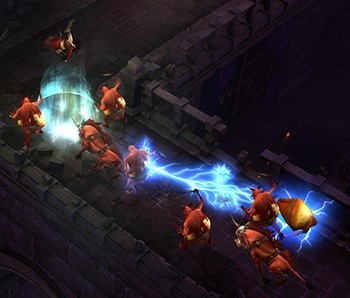 While some miffed Diablo fans may want to blame Cataclysm and SC2 for the game's late release (at least a decade after the last Diablo game, 2001's Diablo II: Lord of Destruction), Pardo explained that each game - as well as the company's unannounced MMOG project - had its own, entirely separate design team. "We just have a different process and approach than a lot of other studios, and it makes it a very difficult process for us to predict street dates when we're multiple years out." Nor is Blizzard bound to fiscal calendars for its releases, said Pardo, even after its parent company Vivendi merged its game division with the infamously profit-minded Activision (under the helm of Gamer Public Enemy No.1, Bobby Kotick). "[W]e know that our fanbase is not going to hold us to a fiscal calendar. With Burning Crusade, we missed Christmas by about three weeks. We could've shoved it out the door, but we decided we didn't need to get it into stores for Christmas. We just needed it to be great and our playerbase is going to buy it whenever it hits the shelves." Who knows when Diablo III will be out? Not us, and not Blizzard. But if the levels I'd played at the past two BlizzCon events are any indication, it'll be f*ckin' awesome whenever it finally sees the light of day. The full interview is over at Techland. For other incidences of Rob Pardo being surprisingly candid about what goes on behind the scenes of the notoriously secretive Blizzard, why not check out our WoW five-year anniversary interview?